This book examines the important insights that psychology and philosophy can offer into the promotion of personal flourishing within organizations and the potential benefits that can accrue in terms of personal development, performance, goal achievement, and teamwork. The first part of the book develops a classical framework on happiness and the meaning of life, setting the stage on which significant aspects of institutional organization and its harmonization with ethics are addressed. The value of institutional ethics, flow, and mindfulness in creating a collaborative working environment that promotes self-fulfilment and enhances performance is then explored in depth, drawing on insights from contemporary psychology. 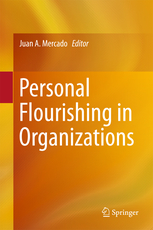 Finally, concrete means of fostering personal flourishing within organizations are discussed. Here, the reader will find an evaluation of the effectiveness of coaching in promoting personal development and goal achievement as well as stimulating discussion of the interrelationship between team building, virtue, and personal flourishing. This book will be of interest to a wide range of professionals and academics within the fields of psychology and business.